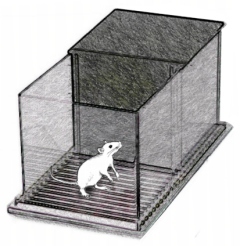 Fear conditioning testing is performed by placing a rodent in a box equipped with a mechanism for tracking the movement of the animal (e.g., by recording photobeam breaks). Context Dependent Freezing is a type of fear conditioning used to evaluate the learned aversion of an animal for an environment that has been associated with a mild aversive stimulus. The dependent variable (measured behavioral response) is freezing behavior. Cue Dependent Freezing is a type of test in which an animal is placed in a box and a tone (usually 80 dB) is delivered for a set length of time, followed by a brief mild aversive stimulus. Later the animal is placed in a novel environment (i.e., one with different lighting, olfactory cues, and visual cues). As the animal moves around in the new environment, the tone is presented and any freezing behavior associated with the tone is measured. The fear conditioning test is used to measure hippocampally dependent associative learning.